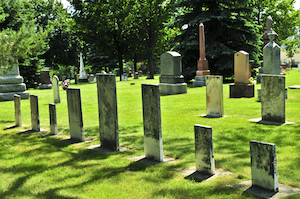 The Alberta Genealogical Society has compiled over 680,000 surnames from grave marker inscriptions, burials records and other types of cemetery records from all over Alberta, including a few cemeteries located across provincial borders in Saskatchewan, and in the Peace River Block of British Columbia. For $2.00 per page plus postage, the Society will search this AGS Surname Database and print a report. Generated reports consist of surnames and any other data that may be pertinent to the individual, such as: given name, birth and death date, age, cemetery name, source, nearest town, plot/grave number and any remarks copied from the marker or records that are of genealogical value. Researchers should be aware every effort is taken to transcribe names and dates correctly; however, some grave markers have deteriorated beyond recognition and written burial records can be difficult to read. On occasions, spelling varies between written record and the gravestone engraving. In most cases, the spelling on the grave marker is presumed correct. Asking for common surname searches, such as Smith or Clark, could result in multiple pages. For example, there are approximately one-hundred John Smith’s listed. In such cases, it is recommended genealogists visit the library to conduct their own search. Library staff will be happy to help. A selected number of Alberta cemeteries have been recorded by AGS and published. These recordings are available for purchase in PDF. For details, email AGS Publications.